Visited on: June 30, 2018. Thiru Neithanam is situated at a distance of about 2 kms from Thiruvaiyaru. It is located at a distance of about 37 kms from Kumbakonam and 15 kms from Tanjore. Other Devara Paadal Petra Shiva Sthalam near this place are – Thiruvaiyaru, Thirukkandiyur, Thiru Chotruthurai, Thiruvedhikudi, Thiruppazhanam and Thiruvirkudi. This is one of the 276 Devara Paadal Petra Shiva Sthalams and 52nd Shiva Sthalam on the northern bank of the river Cauvery in Chozha Nadu (Vadakarai). This is one of the “Saptha Sthana” temples of Thiruvaiyaru. The last consecration ceremony (Maha Kumbabishekam) took place on 09.04.2001. The historical names of this place are Thiru Neithanam and Thillai Sthanam. There are 51 stone inscriptions in this temple which date back to the periods of five Chola kings including Paranthakan-I. In these stone inscriptions this place is referred to as “Rajaraja Valanattu Bainganaattu Thiru Neithanam” and the lord of this temple is praised as Sri Neithanamudaiyar. Most of these inscriptions are related to the endowments and donations made to this temple. Aavoor is situated at a distance of about 10 kms south-west of Kumbakonam on the Kumbakonam to Mannargudi (Via Valangaiman-Govindakudi) route. 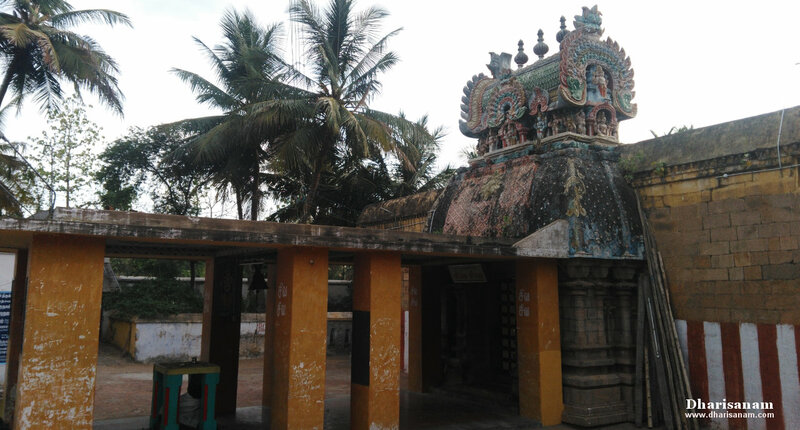 Other Devara Paadal Petra Shiva Sthalam near this place are – Patteeswaram, Thiru Shakthi Mutram, Pazhayaarai, 4 temples in Kumbakonam (Kumbeswarar, Naageswarar, Kasi Viswanathar and Someswarar temples), Thiruvalanchuzhi, Thirukkarugaavoor, Nalloor and Thiruppalaththurai. This is one of the 276 Devara Paadal Petra Shiva Sthalams and 21st Shiva Sthalam on the Southern bank of the river Cauveri in Chozha Nadu (Thenkarai). This temple is called "Then Kayilayam” and it is considered to be as auspicious as Mount Kailash. This temple is famous for its five Bairavas and is known as "Pancha Bairava Sthalam”. This village is called Aavoor and this temple is called Pasupathecharam. As per Hindu mythology, Adisheshan (the serpent on whom Sri Mahavishnu rests) and Vayu (lord of the winds) fought among themselves frequently to test their superiority. During one such struggle, because of Vayu’s severe wind, Adhiseshan failed to hold on to the Mount Meru. In this process, two rocks from the mountain were dislocated and fell onto the earth - one at this place (Aavoor) and the other at Nalloor, a nearby village. It is believed that during the 2nd century, this place was under the rule of Chola kings and this temple was their fort. The historical names of this place are Manikoodam and Asvatha Vanam. Sri Sakthivaneswara Swamy Temple at Thiru Shakthi Mutham (Shakthi Mutram). Thiru Shakthi Mutham is situated at a distance of about 8 kms from Kumbakonam on the Kumbakonam to Avoor route. From Swamimalai, it is about 3 kms and from Dharasuram, it is about 4 kms. Both Swamimalai and Darasuram have railway stations. Shakthi Mutram temple is adjacent to Patteeswaram Sri Dhenupureeswarar / Durgai temple. Patteswaram, Thiruvalanchuzhi, Avoor, Pazhayarai, Nallur, Kottaiyur, Innambur, Thiruppurambiam, Thiruvaikavur, Thiruvisayamangai and Kumbakonam (3 temples – Kudamukku, Keezhkkottam and Karonam). This is one of the 276 Devara Paadal Petra Shiva Sthalams and 22nd Shiva Sthalam on the Southern bank of the river Cauveri in Chozha Nadu (Thenkarai). Lord Shiva offered a tent lined with pearls (“Muthu panthal”) to Saint Thirugnanasambanthar here. The last consecration ceremony (Maha Kumbabishekam) took place on 10.07.2003. In ancient times, this place was a part of the Chola capital “Pazhayarai”. The capital consisted of many villages such as Patteswaram, Muzhayur, Udayalur, Shakti Mutram, Cholan Maligai, Darasuram and Ramanathan Koil. Many Chola kings ruled from Pazhayarai. This temple was renovated and built using granite by the Chola queen Sembian Maadevi. Later it was renovated again by Rajaraja Chola-I. There are some stone inscriptions in this temple which date back to the periods of Chola kings Kulothungan, Rajathirajan and Kulothungan-III. There are also some inscriptions from the times of the later Vijayanagar kings. 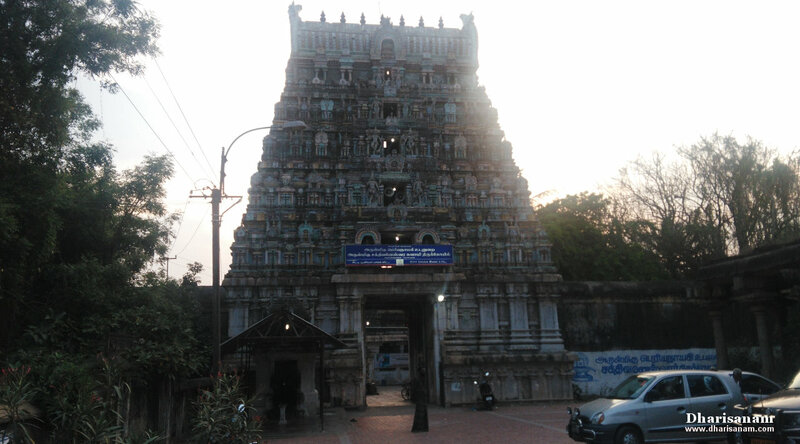 The historical names of this place are Rajarajapuram and Sithimutham. Sri Padikkasunatha Swamy Temple at Arisir Karai Puthur (Azhakaputhur). Visited on: 31st March, 2018. Other Devara Paadal Petra Shiva Sthalam near this place are – Kalayanallur, Karukkudi, Sivapuram, Thiruvanniyur, Kudavasal, Naraiyur Siddheecharam, Thirucherai, Penu Perunthurai, Thalaiyalangaadu, Peruvelur, Karaveeram, Nalur Mayanam, Kaduvaikarai Puthur (Andankoil) and Thiru Kollamputhur. This is one of the 276 Devara Paadal Petra Shiva Sthalams and 66th Shiva Sthalam on the Southern bank of the river Cauveri in Chozha Nadu (Thenkarai). This is the birth place of Pugazhthunai Nayanar, one of the 63 Nayanmars. This is one of the “Moovar paadal petra sthalams”. 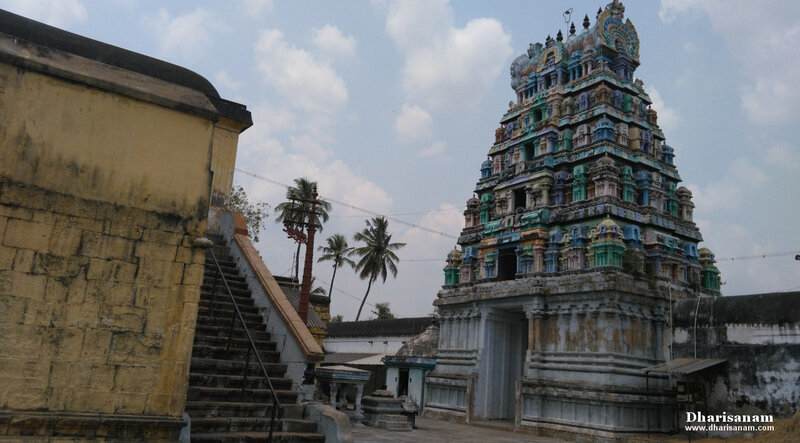 This west facing temple has a single corridor and its main tower (Rajagopuram) has 3-tiers. The last consecration ceremony (Maha Kumbabishekam) took place in the year 2015 and prior to that on 27.04.2001 and 05.09.1982. The historical names of this place are Seruvili Puthur and Arisir Karai Puthur. This temple is situated on the southern side of the river Arasalaru, hence the place gets the name “Arasil karai puthur” (“Arasil” the river, “karai” means bank and “puthur” means village in Tamil). There are seven stone inscriptions in this temple which date back to the periods of the Chola kings. Sri Soundareswarar Temple at Thiru Naaraiyur. Visited on: 19th October, 2017 and 30th March, 2018. Thiru Naaraiyur is situated at a distance of about 8 kms from Kattumannar Koil on the Kattumannar Koil to Chidambaram route, near Kumaratchi. It is about 18 kms from Chidambaram. Other Devara Paadal Petra Shiva Sthalam near this place are – Omampuliyur, Thirukkadampur, Kanattampuliyur, Erukkathampuliyur (Rajendrapatinam) and Thiru Kudalaiyatrur. This is one of the 276 Devara Paadal Petra Shiva Sthalams and 33rd Shiva Sthalam on the northern bank of the river Cauvery in Chozha Nadu (Vadakarai). 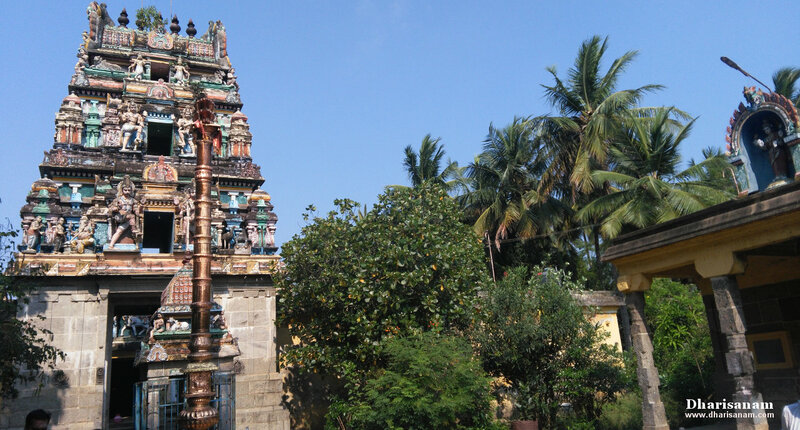 This east facing temple has a single corridor and its main tower (Raja Gopuram) has 3-tiers. Lord Polla Pillaiyar (Vinayakar) in this temple is a Swayambu murthy and is very popular. This is the birth place of Nambiyandar Nambi, who along with King Rajaraja Chola recovered the Saiva Thirumurais from the Chidambaram Shiva temple. The last consecration ceremony (Kumbabishekam) took place on 06.09.2009. The most significant aspect of this temple is the Vinayakar – also called “Polla Pillaiyar”. Polla Pillaiyar means that this idol is not chiselled but has appeared on its own as “Swayambu”. He is very popular and regarded as the most powerful deity here. Visited on: 30th March, 2018. 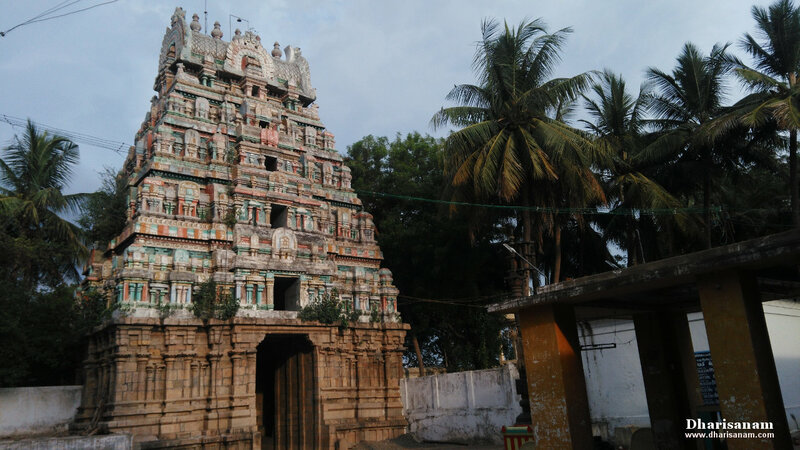 Omampuliyur is situated at a distance of about 31 kms from Chidambaram on the Chidambaram to Kattumannarkoil route. From Kattumannar koil, this place is about 8 kms away and from Kaanattam Puliur it is about 6 kms away. 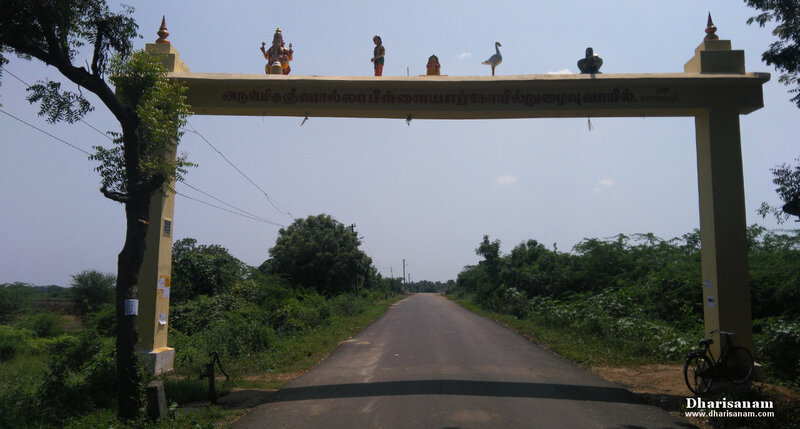 Other Devara Paadal Petra Shiva Sthalam near this place are – Thiru Naaraiyur (15 kms), Thirukkadampur, Kanattampuliyur (6 kms), Thiruvazhkoli Puthur, Thiru Pazhamanni Padikkarai (Iluppaipattu), Erukkathampuliyur (Rajendrapatinam) and Thiru Kudalaiyatrur. 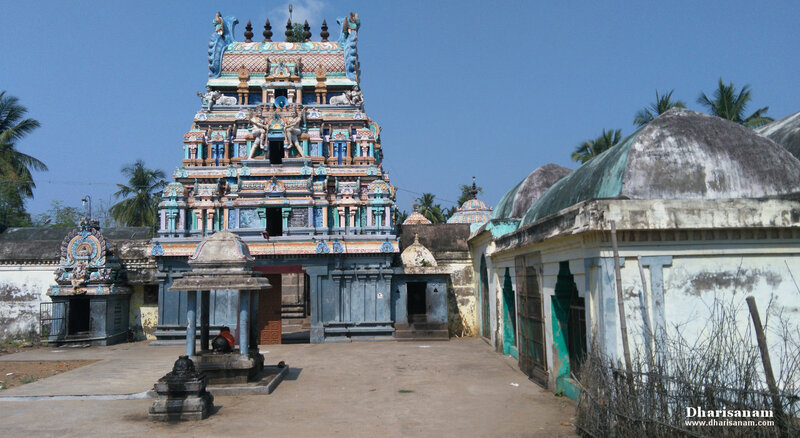 This is one of the 276 Devara Paadal Petra Shiva Sthalams and 31st Shiva Sthalam on the northern bank of the river Cauvery in Chozha Nadu (Vadakarai). This is a famous Guru Parihara Sthalam. This is a Parihara Sthalam for Revathi Nakshathiram (star). In place of the main tower, there is a beautiful arch with sculptures of Lord Shiva and Goddess Parvathy. This east facing temple has a single corridor and its second main tower has 3-tiers. The last consecration ceremony (Maha Kumbabishekam) took place in the year 2011 and prior to that on 25.06.1992. 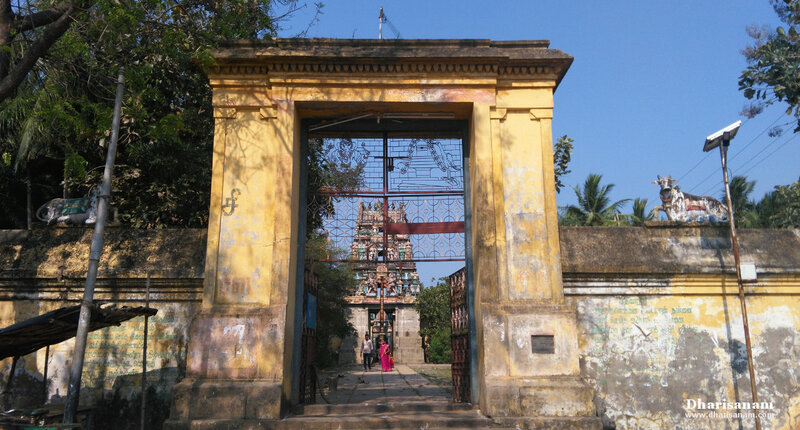 This ancient temple is situated on the northern bank of the river Kollidam. There are six stone inscriptions in this temple which date back to the periods of Chola King Kulothungan-III and Pallava King Kopperunsinga Devar.